Jim Day, a great lawyer, a good friend, and longtime member of The Luncheon Society suggested that we should have Neil Barofsky join The Luncheon Society for a conversation. It was a wise choice. 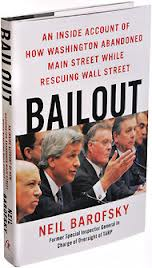 His book, Bailout: An Inside Account of How Washington Abandoned Main Street While Rescuing Wall Street, was published in July 2012. In this excerpt, Barofsky explains the problems he saw with the Home Affordable Modification Program. HAMP — implemented in March 2009 as part of the Making Homes Affordable Program — was a loan modification program designed to reduce monthly payments for homeowners who were delinquent or at risk for delinquency in repaying their mortgages. This excerpt was “borrowed” from the Bill Moyers. “The flood of trial modifications caused the servicers’ systems to first buckle and then break as borrowers seeking to make their modifications permanent flooded the underequipped servicers with millions of pages of documents. The servicers’ performance was abysmal: they routinely “lost” or misplaced borrowers’ documents, with one servicer telling us that a subcontractor had lost an entire trove of HAMP materials. Borrowers routinely complained that they’d had to send their documents to their servicers multiple times — a survey by ProPublica found that borrowers had to submit documents on average six times — but the servicers would still claim that the documents had never been received and then foreclose. The sheer volume also meant that fully qualified borrowers got lost in the storm; servicers would later confess to us that the sheer volume from Treasury’s verbal trial modification surge made it nearly impossible for them to separate the modifications that fully qualified and had a chance to be successful from those that were hopeless. Making matters even worse, Treasury all but paved the way for outright fraud by ignoring my recommendation that it kick off HAMP with a broad nationwide television and radio advertising campaign that would educate home owners about program details and warn them of the dangers of program-related fraud. By disregarding our document and verification recommendations, Treasury had needlessly complicated the transition from trial to permanent modification. In order to ensure that the modifications weren’t scams, we had proposed trial modifications that would automatically convert to permanent status after three payments over three months. Treasury, however, allowed trial modifications to drag on for an extended period, and it was not unusual for borrowers to be stuck in trials for more than a year. Servicers could put just about any borrowers they chose into verbal trial modifications to pump up their numbers and then could refuse to convert them to permanent status as long as just a single document was supposedly outstanding. Aggravating the problem was that the design of the program potentially rewarded servicers who “lost” documents: It could be more profitable for a servicer to drag out trial modifications and eventually foreclose than to award the borrowers quick permanent modifications. Mortgage servicers earn profits from fees, particularly late fees, and under HAMP, Treasury allowed mortgage servicers to charge and accrue late fees for each month that borrowers were in trial modifications, even if the borrowers made every single payment under their trial plans. (The rationale was that by not making the full unmodified payment, the borrowers were technically “late” on each payment.) If the modifications were made permanent, Treasury required the servicer to waive the fees, but if the servicer canceled the modifications (say, for example, for the borrowers’ alleged failure to provide the necessary documents), the servicer could typically collect all of the accrued late fees once the homes were sold through foreclosure. In other words, servicers could rack up fees by putting home owners into late fee–generating trial modification purgatory and then pulling the rug out from under them by failing their modification for “incomplete documentation,” which they did in droves. Indeed, even though Treasury eventually changed its practice of allowing undocumented trial modifications, by early 2012 there were still more HAMP modification failures than successes. As a further incentive for bad behavior, Treasury gave the servicers permission to take all the preliminary legal steps necessary to foreclose at the exact same time that they were supposedly processing the trial modifications. Though servicers technically weren’t supposed to actually foreclose while a trial modification was pending, they reportedly were doing so anyway. Servicers were also apparently demanding up-front payments before putting borrowers into modifications and requiring them to waive all claims and defenses before considering them for one, both blatant violations of program rules. The abuses didn’t stop there, though. One particularly pernicious type of abuse was that servicers would direct borrowers who were current on their mortgages to start skipping payments, telling them that that would allow them to qualify for a HAMP modification. The servicers thereby racked up more late fees, and meanwhile many of these borrowers might have been entitled to participate in HAMP even if they had never missed a payment. Those led to some of the most heartbreaking cases. Home owners who might have been able to ride out the crisis instead ended up in long trial modifications, after which the servicers would deny them a permanent modification and then send them an enormous “deficiency” bill. They were charged for the difference between the modified monthly payments and the original amount of their payments for all of those months, which could be a crippling amount, and were also slapped with a host of late fees. Borrowers who might otherwise never have missed a payment found themselves hit with whopping bills that they couldn’t pay and now faced foreclosure. It was a disaster. Making matters even worse, Treasury all but paved the way for outright fraud by ignoring my recommendation that it kick off HAMP with a broad nationwide television and radio advertising campaign that would educate home owners about program details and warn them of the dangers of program-related fraud. I had begged Treasury to at least run public service announcements in the cities that had seen the highest incidents of fraud in the run-up to the financial crisis, warning that dormant mortgage fraud cells would soon reemerge. They failed to do so, and, as I had predicted, the chaos of HAMP lured a host of criminal predators running fraudulent advertisements for “guaranteed Obama modifications” from coast to coast. Our investigation team worked tirelessly, building those cases and working with other agencies to shut down as many of the scams as we could, but it was a game of whack-a-mole that we could never win. We began doing our best to crack down on them, and one of our earliest criminal convictions came from a case in San Diego brought against the principals of a company called Nations Housing Modification Center. The defendants, who later pled guilty, were charged with running a telemarketing firm that used a mailing address on Capitol Hill and official looking letterhead to give the impression that they were affiliated with HAMP. They charged borrowers $2,500 to $3,500 each and did absolutely nothing in return for the close to $1 million that they stole. Another case took me back to New York to announce charges against the principals of American Home recovery, which operated a similar scheme in which they were accused with not only charging up-front fees but also telling borrowers to forward to them, instead of to the banks, partial “mortgage payments,” which they then pocketed. We helped obtain similar charges in cases around the country. Our investigation team worked tirelessly, building those cases and working with other agencies to shut down as many of the scams as we could, but it was a game of whack-a-mole that we could never win. A broad early public awareness campaign was the only thing that would have given us a chance to combat the fraud, but Treasury didn’t listen about that until it was far too late, not airing its first commercial until the middle of 2010. Treasury also failed to take action against the servicers themselves. Because most of the abuses we saw coming into our hotline involved accusations that servicers had violated their contracts with Treasury, those fell under Treasury’s jurisdiction and there was little we could do other than refer them to Treasury. We did what we could to get the borrowers the help they needed, but ultimately any action against the servicers would have to be brought by Treasury, not us. Treasury, however, demonstrated no interest in taking even the most modest steps to punish them. That was unconscionable, given the pain being inflicted on so many home owners. Despite sending in the documents and making all of his new trial payments for a full year, Citi never provided Fletcher with a permanent modification. When Fletcher called the bank, Citi told him that everything was on track and that he should just be patient. Then, without warning, Fletcher got a call from Citi “telling him that he was 12 months due on his loan and owed $15,000.” Citi had dropped him from the modification. Though no one that Fletcher spoke to at Citi could explain why, they could tell him that if he didn’t pay up in thirty days they were going to take his home. Next Citi demanded that Fletcher resubmit his HAMP application paperwork, which he did. Two days after being told by Citi that his paperwork was in order and the modification was about to go through, Fletcher was contacted by Saxon Mortgage, then a subsidiary of Morgan Stanley, which told him that Citi had sold Saxon the loan. It demanded that he make all of the past deficiency payments immediately. After making a series of calls to Saxon, he found someone who was able to pull up “the history of the now-16-month modification process in her computer.” The specialist acknowledged that Saxon had made a “mistake” and told Fletcher to make the modification payments. But a couple of months later, Saxon dropped Fletcher from the HAMP trial modification, wouldn’t accept any further payments, and was about to foreclose. I remarked to Kevin at one point as the abuses were flooding into our hotline that it seemed as though Treasury simply didn’t care about the suffering of so many borrowers. Instead, Treasury officials seemed too busy congratulating themselves on the trial modifications the program was raking up. “The only ones benefiting from this debacle are the banks,” Kevin astutely observed. We would eventually discover that that was no mistake. Helping the banks, not home owners, did in fact seem to be Treasury’s biggest concern. Treasury’s failure to be forthright with the American people would only increase in the coming months, along with the blowback against anyone who tried to challenge what was becoming an increasingly misleading narrative. A lightbulb went on for me. Elizabeth had been challenging Geithner on how the program was going to help home owners, and he had responded by citing how it would help the banks. Geithner apparently looked at HAMP as an aid to the banks, keeping the full flush of foreclosures from hitting the financial system all at the same time. Though they could handle up to “10 million foreclosures” over time, any more than that, or if the foreclosures were too concentrated, and the losses that the banks might suffer on their first and second mortgages could push them into insolvency, requiring yet another round of TARP bailouts. so HAMP would “foam the runway” by stretching out the foreclosures, giving the banks more time to absorb losses while the other parts of the bailouts juiced bank profits that could then fill the capital holes created by housing losses. All of a sudden, bits and pieces of conversations that I had had began to fall into place. Allison had used the phrase “helping them earn their way out of this” during part of a more extended conversation that summer about his worry that the banks could still collapse. HAMP was not separate from the bank bailouts; it was an essential part of them. From that perspective, it didn’t matter if the modifications failed after a year or so of trial payments or if struggling borrowers placed into doomed trial modifications ended up far worse off, as long as the banks were able to stretch out their pain until their profits returned. Geithner’s revelation (he apparently similarly told bloggers in 2010 during an off-the-record conversation that HAMP had succeeded in extending out the foreclosure crisis) also helped explain one of the odder aspects of HAMP. For many borrowers, the modifications weren’t really all that “permanent.” Instead, after five years, the interest rate would be permitted to rise, much like the resetting adjustable rate mortgages of the financial crisis. This meant that within a handful of years after the “permanent” period of HAMP expired, the average borrower whose interest rate had been reduced to the minimum rate during his modification would eventually see his monthly payments rise by 23 percent, possibly putting him once again at risk of default. Though that policy might undermine the long-term success of the program from the borrowers’ perspective, it made perfect sense if an immediate “foaming of the runway” for the banks was Treasury’s primary goal. For the banks, five years was an eternity. Unfortunately, once I got a chance to speak, the allotted time for the meeting was running down. I used the time I had to impress on Geithner that the administration was losing credibility through its administration of TARP and that that was a self-inflicted wound that could be healed by being more open and forthright with the public. As we wrapped up the meeting, Geithner came across the room to our side of the table to engage in a round of handshake good-byes. When he approached us, he pointed at Kevin. “This guy, Kevin, he was glaring at me the whole time. I was getting nervous,” Geithner said with more of a smirk than a smile. The excerpt from Bailout. I suggest you buy it.